Rhinoliths are calcareous formations found inside the nose, have rare occurrence and are easily confused with infection or obstruction of superior airways. Objectives: To report eight cases of rhinolithiasis, the long time to diagnose them, their fisiopathogenic mechanism, associated symptoms and the chosen treatment, and to provide a short bibliographic review about the theme. Study design: Series report. 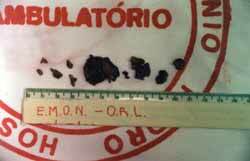 Material and Method: The authors describe eight cases of rhinolithiasis seen at University Hospital Antônio Pedro, UFF, and at the Pires de Mello Clinic, Niterói, RJ, between January 1982 and July 2002. Results: In this period eight cases of rhinolithiasis had occurred. Four of them were males and four females, ages from seven to 76 years old. The most frequent symptom related was nasal obstruction with mucopurulent and rhinorhea fetidness. An assymptomatic case was reported. In half of the cases rhinolith was not found through anterior rhinoscopia, and other diagnose methods were necessary to see the mass. Complementary exams like computerized tomography and simple x-ray of paranasal sinus were used to locate and measure the dimension of calcareous mass, and to study possible invasion of the neighboring structures. The removal of rhinolith was done with topic anesthesia in three cases. Conclusion: Rhinolithiasis are rare, nevertheless they must be always suspected in cases of long time nasal obstruction, nasal fetidness, mucopurulent rhinorhea and chronic headache. Rhinoliths are calcareous masses that may be found in the nasal fossae. In general, women are more affected than men. The most frequent location is the middle third of the nasal fossae, specifically in the inferior portion. Lateral growth of rhinolith takes place preferably towards the nasal septum than laterally, probably because the septum is easily moved 1. Rhinoliths have been found in patients since three to the age of 76 years. The highest incidence is between the 4th and 5th decades of life 2. The pathophysiogenic mechanism of rhinolith formation is controversial. There may be introduction of foreign bodies anteriorly to the nasal fossae (normally by children) or they can reach the nostrils through the rhinopharynx or choanae, during episodes of vomiting, sneezing, choking or in patients with velopharyngeal insufficiency. The objects of vegetal origin are more common (fruit seeds, beans, cotton fibers, cork and wood)3. In this case, we can classify them as exogenous. If they are formed by calcification of fragments from the nasal fossa of the subject (dental roots, bone sequestration, clots, epithelial desquamation and purulent crusts) they can be classified as endogenous 1, 2, 4. The description of the formation of the nostrils has been reported in the literature since 1502, when Mathias di Gardi reported the expulsion of a probable rhinolith from the nostril of a patient3. The first description with documentation of a case of rhinolithiasis was made in 1654 by Bartholin and it described mineralized masses found in the nasal fossae 5, 6. Axmann, in 1829 demonstrated for the first time that rhinoliths were common findings in the nostrils and that they affected also females 6, 7. In 1943, in a review of the literature, Polson noticed that since 1654 over 600 cases of rhinolithiasis had been reported in the medical literature 1, 8-10. Unilateral occurrence is considered more common: there are four cases of bilateral rhinolithiasis described in the literature (Van Alyea, 1952; Caroggio, 1966; Antoine et al, 1978; Chaker, 1978)7,11. DGF, 28 years of age, female, married, born in Rio de Janeiro, her main complaint was foul odor in the nose. The patient reported that since the age of 2 years she had been submitted to treatments owing to the foul odor noticed by her mother. At the age of 4, she conducted clinical treatment for one year of no avail. At the age of 18, she went to a general practitioner that indicated the extraction of the whole upper dental arch. Two years before, she went to a specialist with the same complaint. She was diagnosed with caseous chronic tonsillitis and received the indication of tonsillectomy, but did not undergo it because the patient had ovarian cysts and required urgent gynecology treatment. Some months later, she came to the division of Otorhinolaryngology of Hospital Universitário Antônio Pedro (ORL-HUAP) complaining of nasal obstruction, purulent rhinorrhea and foul odor. 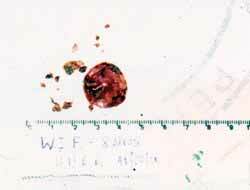 We detected on the floor of the right nasal fossa a dark mass with purulent secretion. We removed the material under local anesthesia and confirmed they were rhinoliths. Ten days later, the patient returned with no further complaints (Figure 1). Male patient, 17 years old, came to the division of ORL-HUAP complaining of severe right nasal obstruction and foul odor in the nose. At anterior rhinoscopy we detected it was a rhinolith. We conducted imaging exams to better localize the mass. Next, we proceed with the removal of the mass under local anesthesia. 19-year-old male patient, came to the division of Otorhinolaryngology at Clínica Pires de Mello with previous diagnosis of foreign body in the right nasal fossa, including radiology exam of the paranasal sinuses (mentalis-nasal and profile sections), confirming the presence of a foreign body. The patient complained of headache, repetitive nasal obstruction, foul odor and episodes of epistaxis. The patient's mother informed that since childhood he used to have nasal obstruction, having been examined by many specialists and diagnosed with sinusitis. Upon examination, we observed a calcareous mass located on the floor of the right nasal fossa, followed by fetid secretion. 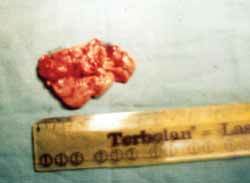 The rhinoliths were removed under general anesthesia in the operating room (Figure 2). 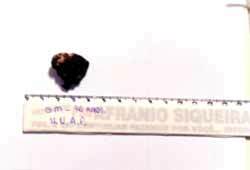 O.N.C., female patient born in Rio de Janeiro, came to the division ORL-HUAP complaining of nasal tumor followed by fetid secretion and facial pain, being frequent symptoms for the past 10 months (when she detected a deformity of the nasal pyramid). After the ENT examination, we detected a calcareous formation on the floor of the left nasal fossa and abundant purulent secretion. After the removal of the rhinolith, we detected the presence of another calcareous mass in the most posterior portion of the nostril, close to the choana, which was also removed through anterior rhinoscopy by deviation. After removal of both rhinoliths, the nasal mucosa presented local granulations that bled upon touch. The symptoms of infection that the patient presented disappeared after clinical treatment. G.M., 76-year-old male, came to the division of Otorhinolaryngology at Clínica Pires de Mello complaining of nasal obstruction, facial pain and nasal foul odor on the left, without visualization of any mass. We detected calcareous mass on the floor of the left nostril by nasal endoscopy with rigid fiber at 0o (Figure 3). The CT scan, conducted at coronal and axial sections, showed an amorphous structure of irregular contours and calcareous density, measuring 2.2x1.4cm, located in the left nasal fossa, mucous thickness of the left maxillary sinus and frontal recesses. The walls of the left maxillary sinus were thickened, suggesting chronic inflammatory process. The patient was submitted to general anesthesia and later removal of rhinolith (Figure 4). L.M., 7-year-old male patient, came to the division of ORL-HUAP complaining of fetid and purulent rhinorrhea on the right for 3 years, associated with facial pain and nasal obstruction. He had already been treated and seen by other specialists, always for sinusitis. We conducted nasal endoscopy with rigid fiber at 0o and 4mm. We visualized a whitish mass on the floor and middle third of the right nasal fossa, followed by marked mucopurulent secretion at the site. We made topical anesthesia and removed the nasal mass. We noticed that the rhinoliths had circular and symmetric format. After that, we conducted stripping and removed the calcareous material of the piece and realized it was a plastic sealing material of old soft drink bottles taps that had possibly been attached to the area when the child was young; throughout the years, it had received a number of calcareous incrustations, transforming it into a hardened and solid mass (Figure 5). E.M.O.N., 26-year-old female patient, was seen in the service of ORL-HUAP manifesting chronic nasal obstruction, purulent and fetid rhinorrhea, facial pain, especially on the interorbicular region, marked nasal pruritus, sneezing and anosmia for 16 years. She reported worsening of the picture during viral rhinopharyngitis, associated with episodes of epistaxis. 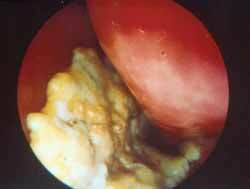 At anterior rhinoscopy we did not visualize any abnormality, including secretion. Under nasal endoscopy with rigid fiber at 30o and 4mm we detected a hardened mass that obstructed the passage of the right nasal fossa recovered by thick purulent secretion (Figure 6). Paranasal sinuses CT scan evidenced a large mass on the right nasal fossa, with calcareous density, hydro-air level in maxillary sinus and opacification of bilateral anterior ethmoid cells (Figure 7 A and 7B). We decided to surgically remove the rhinolith because it was a large mass and because it required joint intervention in the paranasal sinuses. We conducted bilateral maxillo-ethmoid sinusectomy with removal of the rhinolith under general anesthesia. We had to fragment the mass to remove it because it embraced the medium turbinate and hindered its removal (Figure 8). On the first postoperative day the patient referred improvement of pain. Two months after it, the patient had complete remission of symptoms. M.F.T., 16-year-old female patient, came to the service of ORL-HUAP with complaint of odynophagia and discomfort in the throat for some days. She did not have nasosinusal complaints. At anterior rhinoscopy we did not visualize any abnormalities, but we conducted nasal endoscopy with rigid fiber at 0o and 4mm and detected calcareous formation in the floor of the left nostril followed by mucous thick secretion (Figure 9). The rhinolith was removed under general anesthesia, fragmented and the largest fragment was 3x2x1 (Figure 10). The biochemical analysis of the material confirmed the presence of calcium, phosphate, magnesium, oxalate and ammonia. Carbonate, uric acid and cistin were absent. Figure 1. Rhinolith removed from a patient (Case 1). Figure 2. Rhinolith removed from a patient (Case 3). Figure 3. Calcareous mass visualized in the left nasal fossa (Case 5). Figure 4. Rhinolith removed (Case 5). Figure 5. Rhinolith removed from a 7-year-old child (Case 6). Figure 6. Visualization of the calcareous mass and mucopurulent secretion from the right nostril through rigid telescope of 0° (Case7). Figure 7A and 7B. Computed Tomography at axial and coronal 5-mm thickness sections, respectively, showing location of rhinolith in the right nasal fossa (Case 7). Figure 8. Removed rhinolith (Case 7). Figure 9. Visualization of rhinolith in the right nasal fossa (Case 8). Figure 10. Rhinolith removed after the surgery (Case 8). According to the advocators of the endogenous formation of rhinolith, its formation would be analogous to that of biliary, urinary or salivary stones. According to this hypothesis, rhinoliths would have as matrices the bacteria and leukocytes, in which calcium and magnesium deposits are secondarily made 2. However, this theory does not explain the fact that a large number of people present episodes of nasal sinusal infection with the presence of bacteria and leukocytes in the nostrils but not all of them will have rhinoliths in the future. In addition, even if they evolved presenting rhinolith, why would it occur in only one nostril, since the bacteria and leukocytes had been found bilaterally in the presence of infectious processes? Thus, rarity of bilateral rhinolithiasis reinforced the hypothesis of the mechanics of exogenous formation in which there is focal reaction process to a foreign body 12. Some authors related unilaterality of rhinoliths to local anatomical abnormalities (septal deviations, turbinate hypertrophy, nasal pyramid format, nasosinusal inflammation), late manifestation of local traumas or the presence of foreign bodies introduced in childhood and inert at the time 13. We found four cases of rhinolith in men and four in women, being that the literature describes predominance in women 5. Ages ranged from 7 to 76 years. Royal, in 1998, described a case of rhinolithiasis in a 16-year-old adolescent with history of nasal obstruction and chronic posterior rhinorrhea. The most common symptoms described are unilateral fetid rhinorrhea, nasal obstruction, epistaxis, headache, cacosmia, anosmia, epyphora. All those complaints were reported by our patients being that the most common ones were nasal obstruction, cacosmia and fetid rhinorrhea. Carder in 1966 described a case of asymptomatic rhinolithiasis, which is not uncommon 6, and may be an incident finding during routine diagnostic procedures, such as dental x-rays or loco-regional procedures 6. Out of the 8 cases we had, one presented no nasal complaints and the rhinolith was an occasional finding. However, symptoms such as nasal discomfort, halitosis, nasal obstruction, posterior rhinorrhea and, more rarely, erosion of the maxillary sinus and perforation of the palate may be present, being the latter resultant from ischemia and local necrosis caused by the pressure of the rhinolith over the wall of the structures 6. Chaker in 1978 described a case of bilateral rhinolithiasis in which the patient presented episodes of repetitive rhinosinusitis and nasal obstruction for two years. One of our eight cases presented two distinct rhinoliths in the same nostril, a rare fact that was also reported by Sharma (1981). It is not difficult to diagnose, but in most cases, we find long histories and imprecise diagnosis, considering that the symptoms simulate other ENT pathologies such as sinus pathology, allergic and non-allergic rhinitis and viral rhinopharyngitis. In fact, such possibility is not even considered. Diagnosis is not made until the rhinolith gets big enough and starts to cause continuous and exuberant symptoms. Local complications such as periorbital abscess and meningitis can occur, but they are rare 14. Destruction of adjacent structures, such as the hard palate, lateral wall of the nose and nasal septum occur as a result of mucosa ischemia and bone necrosis (release of cell enzymes and activation of osteoclasts), by the pressure exerted by the rhinolith over the tissue and by the associated local infection3. None of the reported cases presented complications, despite the long progression of the disease. The treatment of rhinolithiasis consists of extraction of the rhinolith, first by mobilizing it and then fragmenting it in the nasal fossa, facilitating the aspiration and removal 5. Kharoubi in 1998 stated that the removal should be under local anesthesia, but in children and in the presence of complications (palate perforation, sinusitis) or other associated lesions (polyposis) the removal should be performed under general anesthesia 5. Moulonguet in 1995 described rare cases in which the rhinolith could only be removed by lateral rhinotomy 15. We decided to removal it under local anesthesia in three cases (small masses, anterior location) and with general anesthesia in the others. Despite the fact that it is rarely considered as the cause of nasal obstruction and cacosmia and being described as a relatively rare entity, we should always consider that rhinolithiasis can and many times is present in patients that have nasal complaints, avoiding the delay in the diagnosis and treatment. 1. Appleton SS, Kimbrough RE, Engstrom HIM. Rhinolithiasis: A Review. Oral Surg Oral Med. 1988;65:693-8. 2. Chaker AC Schwartz GS Kole GL. Bilateral Rhinolithiasis. Ear Nose & Throat Journal 1978;57:15-26. 3. Kharoubi, S. Rhinolithiasis: A propos de 3 cas. Revue de laryngologie 1995;116(3):223-4. 4. Bicknell PG. Rhinolith perforating the hard palate. J Laryngol Otol. 1970;84:1161-2. 5. Kharoubi S. Rhinolithiasis associated with septal perforation. A case report. Acta oto-rhino-laryngologica belg 1998;52:241-5. 6. Stoney P, Gingham B, Okuda I, Hawke M. Diagnosis of rhinolithswith rigid endoscopy. The Journal of Otolaryngology 1991;20:408-11. 7. Sharma BG, Sahni RC. Unilateral Rhinolithiasis. Australasian Radiology 1981;25(2):132-5. 8. Davis O Wolff A. Rinolithiasis and Maxillary Antrolithiasis. 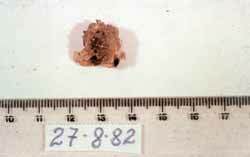 Ear Nose and Throat Journal 1985;64f: 421-6. 9. Polson CJ. On rhinoliths. J Laryngol Otol 1943;58:79-116. 10. Wickham MH, Barton RPE. Nasal Regurgitation as the presenting symptom of rhinolithiasis. Journal of Laryngol Otol 1988;102:59-61. 11. Van Alyea OE, Donnelly W. A Rhinolith: A report of cases. Ann Otol Rhinol Laryngol 1952;61:490-6. 12. Eliachar I, Schalit M. Rhinolithiasis. Arch Otolaryn 1970;91(1):89-90. 13. Montovani JC, Bretan O, Yamashita S, Marinho ngr, Yoshinaga S. Rinolitíase: Atualização e relato de caso. Revista Bras Otorrinol 1997;63(4)341-4. 14. Sacko HB. Rhinolithiase: A propos d'une observation et revue de la littérature. Leerte d'ORL 1995;201:17-18. 15. Moulonguet L, Brette MD, Monteil JP. Deux cas d'obstruction nasale unilatérale liée à une rhinolithiase. 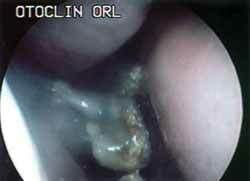 Annales oto-laryng 1995;112:406-9. 16. Royal SA, Gardner RE. Rhinolithiasis: an unusual pediatric nasal mass. Pediatr Radiol 1998;28:54-5. 1 Post-graduate studies under course in Otorhinolaryngology and Bronchoesophagology, Universidade Federal Fluminense, UFF, Niteroi. 2 Faculty Professor, Head of the Discipline of Otorhinolaryngology, Universidade Federal Fluminense, UFF, Niteroi. 3 Joint Professor, Discipline of Otorhinolaryngology, Universidade Federal Fluminense, UFF, Niteroi. 4 Post-graduate studies under course in Otorhinolaryngology and Bronchoesophagology, Universidade Federal Fluminense, UFF, Niteroi. in partnership with Clínica Pires de Mello, Niteroi. Address correspondence to: Dra. Daniela C.C.M. Oliveira - Rua Machado de Assis nº 49 Apto. 702 Flamengo 22220-060 Rio de Janeiro RJ. Article submitted on September 24, 2002. Article accepted on December 13, 2002.